Are Zombies Labor or Capital? As the rest of the story suggests, the narrator’s pessimism about the demand for zombies might be unjustified. “The Dead” raises a number of economic questions, including whether zombies could drive the human working class into permanent unemployment. I hope to address that issue in a future blog post, but for now I want to highlight a narrower question: Should zombies be regarded as labor or capital? 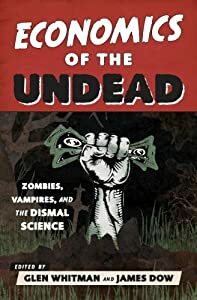 Joseph Mandarino, in his chapter on “Taxation of the Undead,” essentially claims the latter when he says that non-sentient undead (zombies) should be taxed as property, whereas sentient undead (vampires) should be taxed as persons. If zombies are genuinely mindless, then they’re akin to work animals. Work animals are classified (I believe) as capital equipment in the national income accounts, and the income they generate is a return to capital. But in some depictions, zombies aren’t totally mindless. Some are capable of engaging in a certain amount of thought, even strategic planning — as in Return of the Living Dead, where a zombie moans, “Send… more… paramedics” into an ambulance’s radio, thereby summoning fresh brains to the scene. (I took this example from my coeditor Jim Dow’s chapter on “Packing for Zombie Apocalypse.”) In some depictions, zombies even form societies under the leadership of smarter and more foresighted zombies (as Jean-Baptiste Fleury and Alain Marciano discuss in their chapter, “Order, Coordination, and Collective Action among the Undead”). Zombies like these are much closer to humans than equipment. Thus, it appears that sentience is not an all-or-nothing proposition. Zombies exist on a spectrum from fully mindless drones to rational beings. If so, then economists’ sharp distinction between capital and labor (or “K and L” in deeper econ jargon) may be unjustified. Even if we chose an arbitrary dividing line on the K-L spectrum, we could always imagine a zombie that sits right on that fence, wreaking havoc on our presumptively clear-cut distinctions. For what it’s worth, economists’ mathematical tools are fully up to the challenge of treating K-L as a spectrum rather than a sharp dichotomy. But I remember working with models like that in grad school, and trust me on this: it’s enough to make your brain hurt. This entry was posted on Friday, July 18th, 2014 at 2:00 pm	and posted in Uncategorized. You can follow any responses to this entry through the RSS 2.0 feed.